It was an uncomfortable silence in the back of a jeep, bouncing across the snow-covered steppe in Western Mongolia that made me ask my Icelandic companion about Tallinn’s Islandi väljak (Iceland Square). I’d crossed the square in the Estonian capital several months before on a cold November morning and read the inscription on the plaque on the side of the Ministry of Foreign affairs: “The Republic of Iceland was the first state to recognize on 22 August 1991, the restoration of Independence of the Republic of Estonia”, it said. I took a picture of the black and white plaque, posted it to Instagram, and made a mental note to research the connection between the two countries when I got home. Except I forgot. Then, six months later, six hours into an eight-hour journey, with a lull in the conversation and no chance of escape, I asked my travelling companion to explain why Iceland had been the first country to recognize Estonia’s independence. As he was almost 50, I reasoned, he must remember. But he couldn’t explain it. He didn’t know. “I think maybe they were acting on behalf of America”, he shrugged, and then we changed the subject. But that version of events didn’t sound right to me. And it certainly didn’t sound right to Iceland’s former foreign minister Jón Baldvin Hannibalsson when I called him to discuss his, and his country’s role, in supporting Baltic independence. Hannibalsson was foreign minister for Iceland from 1988 to 1995 and his government was the first to support the independence movements in Estonia, Latvia and Lithuania in the early 1990s, as they tried to break away from the Soviet Union. During this time when ministers from each of the Baltic states visited western nations to seek support for their independence movements they were left disappointed; almost all said ending the Cold War with the Soviet Union was the top priority and not the freedom of Estonia, Latvia and Lithuania. But despite threats from the Soviet Union to cut oil and trade to the country, Iceland and Hannibalsson stood by these small nations. In January 1991 Hannibalsson flew to Vilnius just after the January Events which left fourteen people dead and hundreds injured. He also travelled to Riga and Tallinn, where he saw barricades and tanks on the streets. He was the only western foreign minister to visit the Baltics during these turbulent times. “Icelanders tend to support David against Goliath in any dispute,” Hannibalsson told Deep Baltic. These days the memory of the actions taken by Iceland are still easy to see in the Baltic capitals. As mentioned above, there is Iceland Square in the middle of Tallinn, and also in Riga (Islandes Skvērs), which was opened in 2011. In February this year, a new street sign written in Icelandic, featuring the flag, a picture of the country and a snowflake, was unveiled on 1 Iceland Street (Islandijos gatvė) in Vilnius, beneath the Lithuanian language street sign. 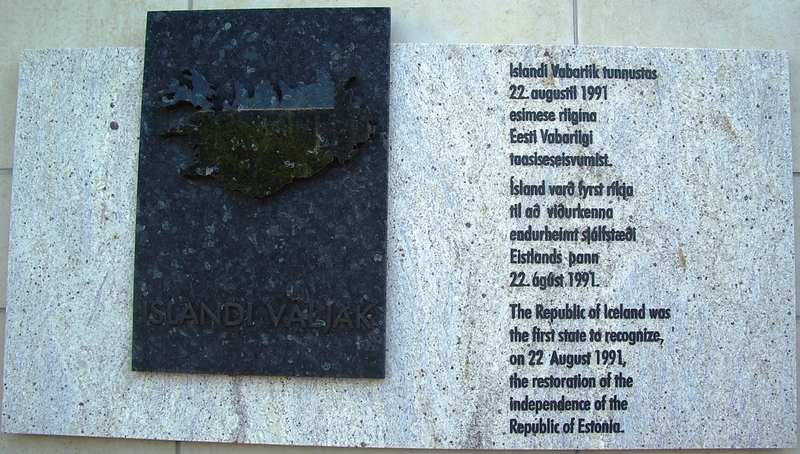 “To Iceland – They Dared When Others Remained Silent” is also inscribed on the rocks from the last barricade built in 1991 outside the Lithuanian Seimas (parliament). For his support, Hannibalsson was awarded the Estonian Order of the Cross of Terra Mariana, 1st Class, the Order of the Three Stars by Latvia and the Commander’s Grand Cross of the Order of the Lithuanian Grand Duke Gediminas, as well as the Medal of 13 January and the title of honorary citizen of Vilnius. Last year a documentary, Those Who Dare, was made by Icelandic film-makers. It retells the chain of events that led up to the Baltics regaining their independence. Deep Baltic spoke with Hannibalsson, now 77, via phone about his role in supporting the Baltic states and what he thinks of the current situation between Russia and its smaller neighbours. Deep Baltic: How did you become involved in supporting Estonia, Latvia and Lithuania’s push for independence? Jón Baldvin Hannibalsson: Well, I became minister of Foreign Affairs and External Trade late in 1988 and I held that position until 1995. The reason why I became involved was, primarily, that the newly established independence movements and the newly established democratic governments in 1989/90 in the Baltic countries sent emissaries abroad to seek support. That was the beginning of our contacts. The first came from Estonia in early 1989, and then two representatives from Lithuania. They had been sent abroad to seek support. This was a juncture in time when they had already had the popular fronts established and had had parliamentary elections, they had established governments, and they were basically expecting and seeking recognition from the west. But they became very disappointed because it turned out not to be an easy matter. You asked why I became involved more than others? Well, there are several reasons. One was, of course, that in my family there were two persons, my elder brothers, who had studied east of the Iron Curtain. My eldest brother had studied in Moscow from 1953 to 1959, and did post-graduate work in Poland, in Warsaw and Kraków. My other brother studied at Charles University in Prague in Czechoslovakia. Both of them had established contacts with dissidents in both the Soviet Union and Eastern Europe, so we had good contacts who were very well informed about the situation. And in my mind was Gorbachev’s attempt at reform – his program of openness and reform, glasnost and perestroika – and I was not very optimistic that these were going to succeed. What did the rest of your colleagues say when you showed your support? The conventional wisdom, the accepted attitude, was this one: we are in the business of ending the cold war and there is a lot at stake. Gorbachev is our partner in ending the Cold War and what was at stake was disarmament, both nuclear and conventional. It was the withdrawal of occupying forces from Eastern Europe, the liberation of Eastern Europe, the peaceful reunification of Germany and the hope that unified Germany would continue to be a member of NATO. And the conventional wisdom was that all of this was dependent on Gorbachev’s goodwill. Gorbachev, for his part, drew a line in the sand, saying I will go along with disarmament in Eastern Europe and reunification but when it come to the borders of the Soviet Union, I will never accept the break-up of the Soviet Union. President Bush went as far as going to Kiev in Ukraine to give a speech, which later became infamous as the “chicken speech”, where he appealed to Ukrainians not to give into, succumb to extreme nationalism and to please keep the Soviet Union together in the name of peace and stability at all costs. This was the official line. And the question was simply this – were they right? Was this based on faulty analysis or a superficial take of what was going on in the SU? My attitude was basically this one: it was extremely unwise to put all your eggs in one basket, to make the success of failure of your policy utterly dependent on the goodwill of a single individual. I did not take it for granted that even if he would fall that the hardliners would not come back. I simply did not believe that. And it turned out that their analysis was wrong. I was critical of the official Western attitude and more positive towards what the leaders of the Baltics were asking for. I would like to add that only among the foreign minister of NATO who actually shared my view was Uffe Ellemann-Jensen, the Danish one. How did the rest of the Icelandic government feel about your analysis? Did they share it or were you quite isolated in your beliefs? Iceland, like any other country, has to take care of its national interests, and for historical reasons we had an independent trade relationship with the Soviet Union. It began in the early 50s when we were expanding our economic zone and our fishing limit in conflict with the British. The British responded by closing the markets and putting an embargo on Icelandic exports – and it was our most important market. The Soviet Union, during the Cold War in 1952/53, stepped in and it was the beginning of our trade agreement, which meant that the SU supplied Iceland with petrol for our fishing fleet and transport in return for, mainly, basically seafood. So it was an important trade relationship. In terms of share of exports we were number two after Finland, with the Soviet Union as the most important trading partner. But the Soviet Union at this time was in rapid decline. It had been in long-term decline under Breznev. Our market share was also declining, and as a matter of fact, we could easily get other markets at that time, for better quality and higher prices, and we could also secure supplies of petrol from different suppliers. So this was not a dire economic threat. Nonetheless, the sheep owners and the fishing industry in Iceland was very critical and they tried to put pressure on some politicians, but they did it always behind the scenes because they realised that the cause of Baltic independence among the people in Iceland was very popular – for the simple reason that Icelanders tend to support David against of Goliath, in any dispute. Iceland did not have full independence until 1944. Is that something that drives its support and feelings of solidarity for smaller nations? Iceland won its independence in stages. We can say that home rule started in 1904; at the end of the First World War we really became an independent sovereign nation, but we shared the Danish King, and then finally we became a republic in 1944. But this was a long, drawn-out independence struggle against the Danish colonial power and this fact, this long drawn-out struggle against foreign control is very defining and influential in Icelandic political discourse and the mentality of the people today. So Icelanders tend to be fiercely independent-minded and they tend to support small nations in their discourse with bigger powers. Did you get much support from the Baltic diaspora communities who were living abroad at that time? Well I was aware of the fact, of course, that there had been massive emigration from those countries and I was aware of that in Canada, Australia, America and Germany that there were considerable numbers of émigrés. But, the only organisation that had some contact with us was the Lithuanian organisation in the US. Apart from that they were not in special contact with me, no. I met an Icelander earlier this year and I asked him about the part Iceland had played in Baltic freedom. He was under the impression that Iceland had acted as a proxy for America. Is this something you hear often and is there any truth in it? This was created in response to the fact that there was an underlying discontent with the lack of support that had come from the leadership. So after the event they had to give some sort of explanation, and the explanation was this. Even if they didn’t support it up front, they are now trying to say they did behind the scenes by directing Iceland. This is all falsification and there is not a grain of truth in it. I was foreign minister for seven years and during that time there were four secretaries of state in the US and not a single one of them ever discussed Baltic issues with me. The only messages I got from them now and then informally and especially at NATO meetings were critical: saying be careful – there is too much at stake and you should be very careful in what you say and do, because there is a lot at stake. This is the traditional attitude of big powers towards small nations. The bottom line: it is an attempt at beautifying the picture afterwards, but again, there is not a grain of truth in it. How did you feel when you first heard that version of events? Well, I’m an old politician, so I am not surprised at anything. Looking back at those events in 1991, is there anything you would have done differently? Oh, I don’t think so. I think I followed my convictions. There were two crucial events events at that time: one was the CSCE conference in Copenhagen in June 1990, which was one of a series of conferences between East and West negotiating the end of the Cold War, when the Danish host invited the newly appointed foreign ministers from all three Baltic countries. This one was basically on human rights and the Soviets protested and said if these people are admitted, then we are out, and they fully threatened the break-up of the peace process and the Danish foreign minister, unfortunately, capitulated. This was the first time and simply came up at the conference and spoke only on behalf of the Baltic nations because they had been thrown away. It is very memorable especially at that time that the American representative was Max Kampelman, a famous Sovietologist, he embraced me after my speech and said, and I quote him, “it is a great privilege to be a representative of a small nation and be allowed to speak the truth”. And that was it. The Soviet representative, who later became Russia’s ambassador to Iceland, shook his fist at me and said: “Everything you said in your speech about the Soviet Union was a lie”. So I defined my attitude very clearly at this conference and it was reported back to the Baltic countries and that is why basically my name recognition is so high in those countries because I was then only friend speaking up for them when they were being silenced. And then the other crucial thing was that I responded to Vytautas Landsbergis’s appeal during the crucial time of early January 1991. I simply arrived on the scene in Vilnius. He had appealed to many other countries and no one else responded. As a matter of fact, I went to all three Baltic countries at this time. This was January 16th to 22nd. I came there a few days after the TV Tower massacre [in Vilnius, on January 11th, 1991]. What was it like in Vilnius at the time? It was unforgettable. There were hundreds of thousands of people in the streets and squares of Vilnius. It was January, bitterly cold and damp. People were standing by bonfires in every square and street, singing national songs – and of course it was all on the brink. There were troops and tanks on the move and no-one knew what was the Soviet military position. Would they apply full force? I became convinced that if they had applied full force then this would have been the greatest bloodbath in Europe in the postwar era. I sensed, being among the people, that they would not so easily have given way; they would have resisted, even if they had been unarmed. It would have been a terrible bloodbath. And luckily, at the last moment, Gorbachev came to his senses, and he saved his soul and his reputation by doing so. But this was the moment; after that, as usual in police states and dictator states, if the elite does not have the stomach for violence, it means the beginning of the end of a dictatorship, and that’s what happened. And what was it like visiting Tallinn and Riga at this time? In Riga there were shoot-outs and special troops from the Interior Ministry in Moscow on the move and quite a few killings. In Tallinn there was a line up of tanks from the occupying base into the centre of town, but again, at the last moment, they stopped before Toompea Hill where Parliament was sitting. As a matter of fact, I have heard that the commander, the Soviet commander who took the decision to stop before it became violent, was a man with the name of Dzhokhar Dudayev. He was from Chechnya and he later returned to Chechnya to become the leader of the Chechen independence movement. I think there is a monument in his honour [this can be found at 8 Ülikooli Street, Tartu, Estonia, where Dudayev used to work]. After this what were the relations like between Russia and Iceland? Well, after our declaration of support for the Lithuanian declaration of independence the Soviets became offended but did not take action until after my visit in January 1991. They took diplomatic action to withdraw their ambassador from the capital, Reykjavik and sent a very tough note, accusing Iceland of interfering in the domestic affairs of the Soviet Union. I took this very seriously and put together a team of legal experts, also with help from Estonia, and answered the note in purely legal terms, saying as a matter of fact we are not interfering in the domestic affairs of the Soviet Union. The occupation and annexation of the Baltic counties at the end of the Second World War was clearly illegal and the Soviet congress of deputies had already by that time accepted it, because they had declared the Molotov-Ribbentrop Pact and its secret protocols, which were the justification for the annexation, as null and void. Then I simply proved that under various obligations the Soviet Union was under obligation to respect the borders of those countries. I even offered myself as a mediator between the Baltic countries and the SU. As a matter of fact, they never answered this. The other things, the threat to cancel trade was by that time very, very weak because the economic state of the Soviet Union at that time meant trade was declining and becoming less significant day by day. So, for a while, threatening to break off diplomatic relations and trade deals was the Soviet reaction. But the political fact is that by that time the Soviet Union had become so weak that those threats from the once-great super power were rather empty. What are your thoughts on the current situation between Russia and the Baltic states? The primary thing is this: the man in charge in the Kremlin, Vladimir Putin, is on record as having said – and I quote – “the fall of the Soviet Union is the greatest strategic catastrophe of the last century.” His policy is to try to restore again to Russia the power of the Soviet Union, and that is the basic motivation and essential explanation of his policy. If we look back at the three Baltic countries, they have used the time since independence to prepare for the eventuality of a powerful Russia. The key to the success of the three small Baltic countries is this: despite all economic difficulties in the transition period, despite all the political turmoil during the same period, the political leadership – left, right and centre – basically agreed upon the necessity for those three countries to return to the European family of nations and to join the European Union and NATO. They stuck to difficult decisions to gain membership and this gave them a sort of discipline to stick to a consistent policy. They succeed in doing this by 2004 and of course this changed the situation entirely. They are now part of the EU and NATO, which means that even if Russia is threatening they are in a totally different and much stronger position than if they had not pursued this policy. The comparison is with Ukraine, of course. Ukraine’s leadership failed utterly to do their job and implement reform during the past two decades. They failed utterly in the Orange Revolution and Ukraine is in terrible shape, both in terms of its economy and its weak position with Russia. Even if Russia tried to create political turmoil inside the Baltic countries, appealing to the Russian ethnic minorities there, it is not necessarily so threatening because there is considerable integration and assimilation in the Baltic countries. There are very few Russians who would actually go back to the old times, because the fact is the standard of living and the quality of life is much better in the Baltic countries than in Russia. And finally, do you see any real threat from Russia to the Baltics? No, not really. They are threatening postures airspace, sea-space and at the borders but this is not a real danger, no. Helen Wright is Estonia editor at Deep Baltic. She has written for ERR News, The Baltic Times and Estonian World. Previously she worked at local newspapers in the UK.